This week, analysts were up in arms after Tesla released production and delivery numbers, and then announced a $2,000 cut in US prices to blunt a drop in the EV tax credit from $7,500 to $3,750. During the fourth quarter, Tesla continued to ramp production beyond 5,000 per week, increasing Model 3 deliveries by 13% sequentially to 63,150. In their cautious notes, analysts highlighted that Tesla missed their delivery estimates by 500 cars and that the lower prices signaled waning demand and lower margins. On Tesla’s third quarter earnings call, Elon Musk responded to a question about the Model 3 by saying, “We are trying to provide [the] most affordable electric car options that we can. And since we just don't have the ability to get to the $35,000 car right away, we thought this might be a way to offer it as an intermediate step.” We consider the price decline announced this week another intermediate step. Because the technology on which they are based has matured, the MSRP of gas-powered cars typically increases every year. That Tesla can reduce prices should concern traditional auto manufacturers, as the EV is in the early stages of its technology cost curve decline. During the next few months, as Tesla begins to sell the Model 3 into Europe and China, both, we believe, being larger markets than the US, Tesla will continue to drive prices down the EV technology cost curve. To its great benefit, Amazon has been taking the friction out of making transactions. In its first full quarter as a publicly traded company in 1997, Amazon filed its famous One-Click purchasing patent. Now, it subsidizes the physical buttons that allow customers to re-order laundry detergent or batteries instantly, and is shifting purchasing away from clicks on screens to simple voice commands on Echo smart speakers. To its fintech line-up, Amazon has added Amazon Go, a convenience-store without cashiers, check-out lines, or point-of-sale terminals. Instead, cameras, artificial intelligence (AI), and sensors enable consumers to pluck items from selves and “just walk out”. 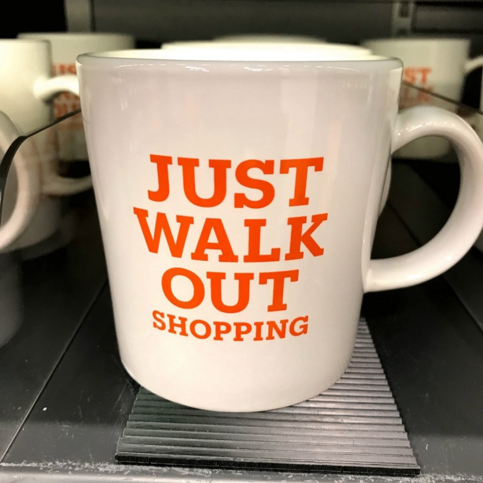 Thus far, Amazon Go pilot stores are enjoying lots of walking-in and walking-out. 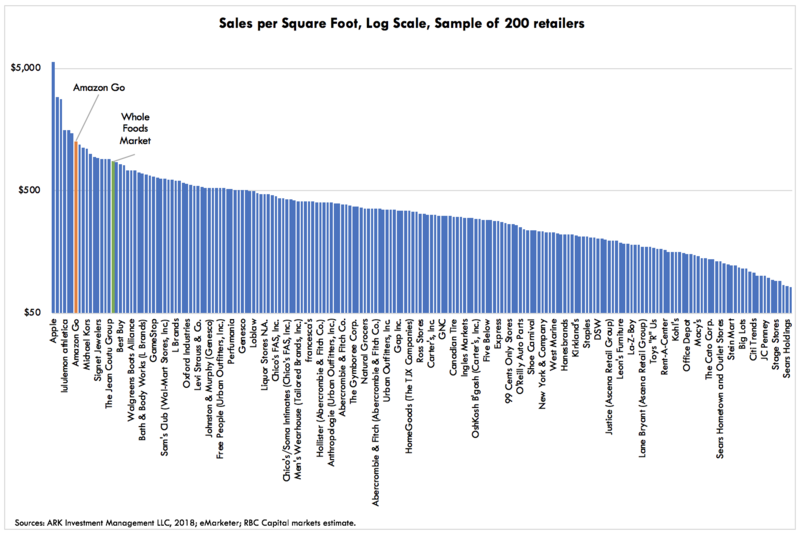 As shown in the RBC chart below, their sales per square foot are roughly $1,275, nearly three times the national retail average and almost 50% above that of Whole Foods , which Amazon purchased last year. Not surprisingly, rumors are running high that Amazon will roll out as many as 3,000 physical stores by 2021. With much less labor and superior sales per square foot, Amazon could be poised to disrupt traditional convenience stores. Imagine a corner bodega with the quality and pricing of supermarkets, but without the wait to check out! With Whole Foods at $874 per square foot per eMarketer. Developers are revolting against the Apple App Store. This week Netflix said it will disable in-app billing for the iPhone, forcing new subscribers first to create accounts through the Netflix homepage, then to enter payment information manually, and finally to log-in through the App Store. Netflix and others are rebelling against the 15-30% cut that the Apple App Store takes out of all digital sales. That business model does not work for companies with gross margins in the same range. With 25% gross margins, Spotify disabled in-app billing for new subscribers in mid 2016. PC developers are revolting too. Epic, maker of the popular game Fortnite, is launching a new game store with a 12% fee instead of the customary 30%. In China, developers increasingly are embracing “mini programs”, web-like apps that load in Tencent’s WeChat messaging app. It appears they would have nothing to do with Apple’s App Store. The more lucrative a business, the more vulnerable it becomes to disruption. A cash cow for years, Apple may have to give up some of its margin to attract developers back to its App Store. After three consecutive downward adjustments, the longest such streak in its ten-year history, Bitcoin's Proof of Work difficulty now is up 10%. As described in a previous newsletter, proof of work difficulty is a measure of the difficulty to hash a block. Difficulty is set so that, on average, the hash of a block takes roughly 10 minutes. The total hash rate of the Bitcoin network is the difficulty’s biggest determinant: every 2016 blocks, the Bitcoin network reassesses its global hash rate to determine whether the difficulty is consistent with the network's ability to find blocks every 10 minutes. A few weeks ago, Bitcoin's mining difficulty dropped 15%, exceeded only by the 18% drop in November 2011. The magnitude of the drop created fear that Bitcoin mining had entered a death spiral, which the upward adjustment this week put to rest. Historically, the average PoW difficulty adjustment has been 9.3%. Only 24% of difficulty adjustments have been downward, the longest consecutive streak at 3. 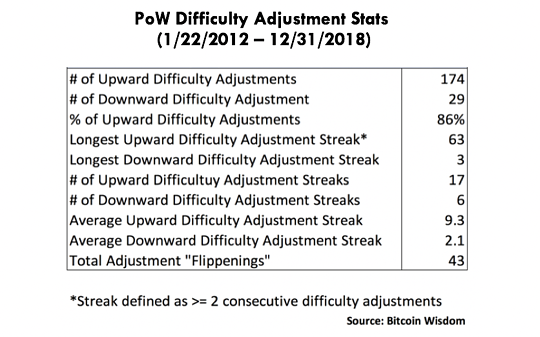 The longest upward PoW difficulty adjustment streak, however, has been 63. Below is a table of PoW difficulty adjustment statistics since 2012. Based on historical PoW difficulty adjustments, the recent fears of Bitcoin’s death spiral were unwarranted. Game theory suggests that Bitcoin’s incentive system makes a mining death spiral highly unlikely. The data above illustrates that Bitcoin’s self-correcting distributed system is working as designed. Unicorns, the club of private companies valued at $1 billion each or more, added 47 new members in 2018, on top of the 57 in 2017. At the end of 2017, the unrealized value of US unicorns was roughly $600 billion and could be around $700 billion today. Concerns are building that the pre-IPO space is overvalued, especially given the high-profile IPOs that have been announced for 2019. Even venture capitalists (VCs) are wary of unicorns. As long ago as 2016, a survey found that 91% of them considered unicorns either slightly or significantly overvalued. Substantiating the case for overvaluation is a study by the National Bureau of Economic Research (NBER), the University of British Columbia (UBC), and Stanford University. Analyzing the contractual terms associated with each tranche of private equity sales for a sample of 135 unicorns, the authors concluded that they are overvalued, on average, by 48%. Typically, bankers portray post-money valuations as a product of the share price in the most recent funding round and the total number of shares regardless of the funding tranche. They value all shares the same despite the fact that late-stage investors often demand shares with superior cash flow and control rights, in effect devaluing shares issued to early-stage investors and employees. The NBER, UBC, and Stanford University throws such valuations into serious question. In a recent blog post, Invitae (NVTA), one of the leading molecular diagnostic test companies, exposed the challenges associated with direct-to-consumer (DTC) genetic tests. Based on its study, 88% of DTC tests did not detect DNA variants correlated with an increased risk of breast cancer. Moreover, roughly 50% of consumers who sought second opinions after a positive DTC test learned that their first results were false positives (FP). Misclassifying FP and true positive (TP) results increases test costs and causes misdiagnoses. Earlier this week, Invitae published a detailed study including its algorithms for identifying TP and FP results. The goal was to flag 100% of FPs while minimizing the number of TPs misconstrued as FPs. Invitae’s protocol differs from conventional ones in two significant ways. First, the study included 200,000 unique DNA variants. Earlier studies with small datasets suffered from overlaps in training and validation data, resulting in imprecise algorithms. Second, Invitae’s system was dual layer, meaning that a rough filter removed more obvious FP calls and a second filter sorted indeterminate calls from high-confidence TPs. Invitae’s algorithm captured 100% of FP results while minimizing the number of TPs subjected to secondary, downstream analysis. By reducing the number of confirmation assays, Invitae is making genetic testing cheaper, more efficient, and more effective than DTC and other molecular diagnostic tests.